Since April this year I have had the invaluable opportunity to train for two days per week in the beautiful gardens of Chawton House Library through a placement organised through the Women’s Farm and Garden Association’s ‘Work and Retrain as a Gardener’ (WRAGS) scheme. 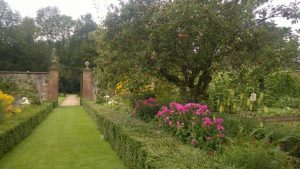 The scheme offers a chance to train in horticultural skills under the instruction of a head gardener and it was the idea of Chawton’s Head Gardener Alan Bird to introduce the scheme to Chawton House. 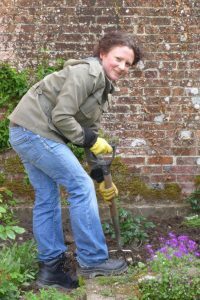 Receiving training from the Head Gardener in a range of gardening skills, I have assisted with a variety of tasks essential in maintaining the garden – I hope that I have provided some useful extra help! 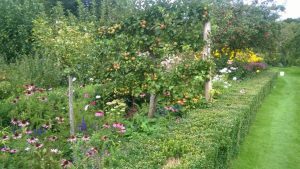 Learning different skills week by week and seeing the garden change through the seasons from frosty spring mornings to hot summer afternoons with the herbaceous borders in full bloom and Walled Garden bursting with produce, has been an insightful experience. The Walled Garden is my favourite part of the gardens. Built in 1818-1822 by Edward Knight, I love the sense of history in the Walled Garden in particular. I am intrigued to think of gardeners past who have worked at Chawton House – fascinating photographs of the garden from the early part of the 20th century can be seen in the shed within the Walled Garden. In recent years the Walled Garden has been developed as an ornamental kitchen garden (also known as a potager) combining vegetables and ornamental plants; espaliered apple trees, herbaceous borders, pretty annuals and roses can be found alongside rows of vegetables, and fruit bushes producing for example delicious raspberries and gooseberries. During my placement I have been taught how to care for the Library’s gardens including the herbaceous and mixed borders, Rose Garden, and kitchen garden. For example in the spring I helped to plant the borders with additional herbaceous perennials to ensure masses of colour and interest throughout the summer. I’ve also done plenty of weeding and deadheading to help maintain the gardens and have been shown how to prune the Library’s spring and summer flowering shrubs and climbers such as wisteria so that they will give their best. 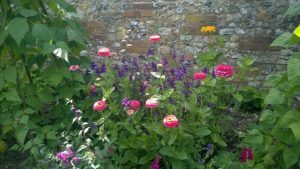 Protected growing is also an element of the WRAGS scheme and I am especially pleased with the zinnia flowers which I sowed from seed in pots – they have made a bright addition to the Library’s summer borders with, for example, their shades of pink contrasting against purple salvia. In the kitchen garden I have learnt how to cultivate the soil, sow and care for fruit and vegetables from leeks to raspberries. 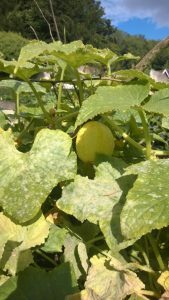 I have been intrigued by some of the varieties grown – such as the Crystal Lemon cucumber, a climbing variety cultivated since 1894 with fruit which look similar to yellow apples. The placement has also been especially useful in developing my knowledge of plants and their botanical Latin names. My favourite new plants and trees include the stunning Judas tree (Cersis siliquastrum) which grows against the outside of the Rose Garden’s walls with rosy pink flowers in late spring and Monarda didyma (Bergamot), a herbaceous perennial with aromatic leaves and showy pink flowers in summer. As a garden open to the public, it is rewarding to see visitors both from all over the world and more locally enjoying the gardens. My hope is to gain the skills and experience which will enable me to leave my desk behind for good (anyway, for most of the time!) and pursue a career in horticulture. With the benefit of my experience at Chawton House which has helped bring to life the theory learnt during my studies for Royal Horticultural Society exams, I’ve made the first few steps along the way.